Video_TS files are one of the main folders in a DVD’s contents. Yeah, you can view the Video_TS files on your computer and DVD players. However, if you want to put your movies on portable Android devices like Galaxy Note 4, Galaxy Tab S, Nexus 6, Nexus 9, Kindle Fire HD(X), Xperia Z3, etc, you will need to convert Video_TS to an Android playable format like MP4 at first. To get the work done, many solutions seem promising, such as AutoGK, VirtualDUB, Handbrake, etc., but it seems like all involve some form of DVD re-authoring. Is there a solution that offers (for lack of a better description) a “one click” approach to cope with the entire VIDEO_TS folder? Well, one of my friends gave me some hints. In fact, it’s quite easy to realize if you have Pavtube DVDAid. It is the right Video_TS converting tool to help you convert DVD, DVD ISO/IFO and entire Video_TS to Android compatible mp4 format without any troubles. 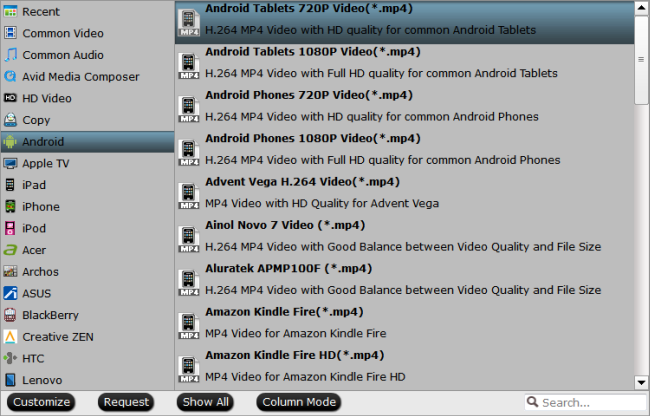 Besides, you can also encode your DVD Video_TS folder to MKV, MOV, M4V, AVI, WMV, FLV, MPEG, etc. formats for playing freely. 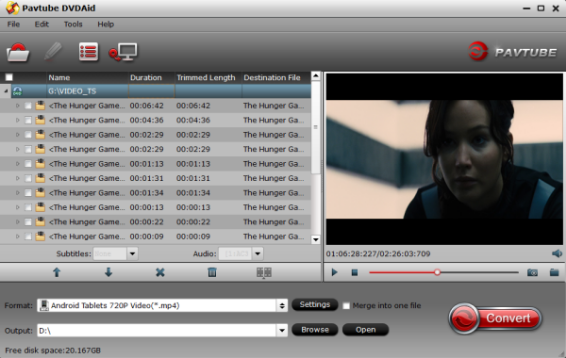 Furthermore, the built-in editor lets you edit and touch up your movies to get the part and effect you want. Mac users can simply turn to DVDAid for Mac. (Read the review) Now download this program and follow the steps below to finish your task. 1. Load Video_TS folder > Launch the VIDEO_TS to Android converter and click “Load DVD” to select and load the Video_TS folder to the program. As you can see, added files will be displayed on the left source pane and can be previewed on the right preview window. You can select the titles you want to convert and rip them to separate video files or a single video by clicking “Merge into One File”. 2. Choose output format > Click on the dropdown menu of “Format” and choose formats under “Android” option. Here you find almost all the Android tablets & phones on market, Samsung Galaxy Tab, Acer Iconia tabs, Amazon Kindle Fire, HTC, Motorola, Xoom, Toshiba Thrive, Sony Tablet, Google Nexus 7/10, etc. And you can also find optimized format for iPad, iTunes, BlackBerry, Apple TV, etc. 3. Start to convert > When all the settings are OK, click Start to convert your Video_TS files to Android friendly MP4 format. And when the conversion completes, click Open t to locate the converted MP4 videos and get the ripped videos for much more convenient playback on Android tablets & phones on the go.